Hans Storrer is a ten-year veteran of the United States Coast Guard. Successfully completing the Coast Guard’s Culinary Training as well as the Army’s Advanced Culinary Training programs with high honors, he became a valued Culinary Specialist in the United States Military. 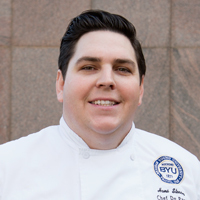 With almost twenty years of culinary experience, Hans has had the opportunity to cook on the high seas of the South Pacific to The White House in Washington D.C. Now as BYU Catering’s Sous Chef, he has loved the chance to bring his knowledge and unique skillset to collegiate fine dining.